CASTLETON—The Vermont Fish & Wildlife program to introduce the new Birdseye Wildlife Management Area was well attended despite the fierce windstorm the night before, Friday, May 5, that knocked out power from Clarendon to Pittsford and caused extensive tree damage throughout the area. The event was held at the Kehoe Conservation Camp on Point of Pines Road in Bomoseen, where a spectacular view of the new WMA could be enjoyed from the outdoor deck. Inside, participants munched on vegetable and fruit finger food, crackers and cheese provided by the Conservation Fund. 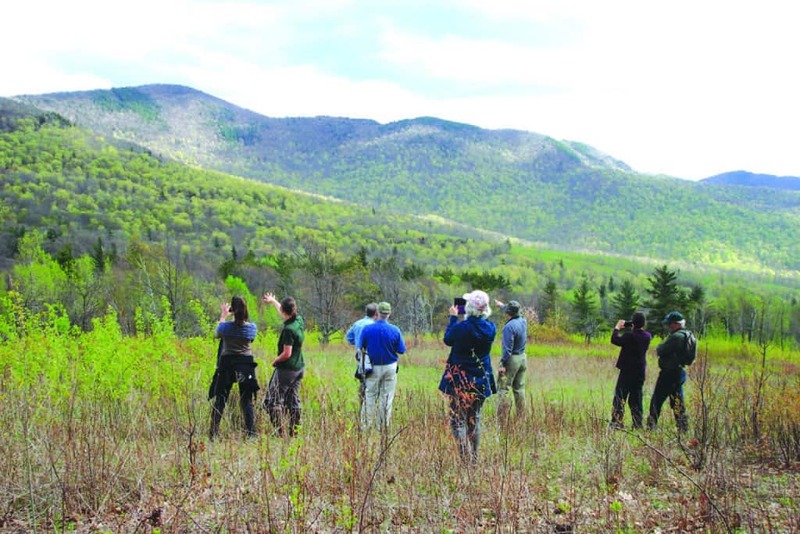 Mark Scott, director of wildlife, opened the proceedings by describing the new WMA, which expands the preexisting Bird Mountain WMA to a total of approximately 4,000 acres within the towns of Ira and Poultney and is now christened Birdseye Wildlife Management Area. It is the second largest intact habitat block in the Taconics, yet is close to Rutland’s bustling city life. A slide show of the landscape and wildlife supplemented the talks. Scott then introduced the commissioner of Vermont Fish & Wildlife, Louis Porter, a Vermont native and outdoorsman. Porter said Vermont is “in the restoration business” for species that had disappeared from Vermont in the past such as the whitetail deer and wild turkeys. He praised the Fish & Wildlife staff as well as the board for their important work, and expressed appreciation for the excellent relationship with U.S. Fish & Wildlife. The new secretary of the Agency of Natural Resources, Julie Moore, told the group that Vermont is an important link in the wildlife corridor for the Northeast region and that ecological connectivity is essential to biodiversity on a regional as well as a local scale. Nancy Bell, director of the Conservation Fund, which provided the intermediary step in the purchase of the acreage, then took the podium and expressed her heartfelt gratitude to both the Fish & Wildlife department and the towns of Ira and Poultney for this accomplishment. Bell said this is a story about rocks and people. She had brought samples of bedrock to decorate the tables, and briefly referenced the tectonic movements that created the Taconic bedrock, which over the ages has given sustenance to the natural communities here. The human communities of Ira and Poultney, she said, were “spirited, hardheaded and bighearted” and demonstrated their commitment to conservation at every level in the face of a lengthy resistance to a massive industrial wind project that would have crowned the ridgelines with a row of giant turbines. She acknowledged that it was a “challenge for the towns to consider state ownership,” and said the support of the select boards and the planning commissions was critical to public involvement and backing of the proposal. Bell then presented framed prints in appreciation to Paul Donaldson, town manager of Poultney, Larry Taggart, former Select Board member of Ira, and Annette Smith, the nemesis of Big Wind, who helped the towns avoid certain ecological disaster. She introduced Karen Freeman, conservation director with the Vermont Housing and Conservation Board, and Donald Campbell, Southwest director of the Vermont Land Trust. Both organizations are now co-holders of the comprehensive conservation easement for the WMA. She also expressed thanks to Justin Lindholm, Green Mountain Power, and the townspeople of Tinmouth, Middletown Springs and West Rutland. After the program a small group ventured out to visit the site, led by Justin Lindholm and F&W personnel including Jane Lazorchak, land acquisition and stewardship coordinator. In addition to viewing the cliffs where peregrine falcons nest, the group visited the Flynn cellar hole, home of the grandparents of a member of the group. Lindholm’s intimate knowledge of the area as a prior landowner on Bird Mountain added immeasurably to the experience for all. Justin Lindholm (right center), former F&W board member, interprets the new WMA for participants who hiked up to Bird Mountain.